I have unbundled the kits, and now sell all the components separately. For kids, I would still recommend the Shimotsuke Tenkara Gen rod, either the 2.4 for younger children or 2.7 for older children. I would still recommend size 4 hi-vis fluorocarbon line. The brand doesn't really matter. I use them all interchangeably. I would still suggest a pair of the round blue Tenkara Line Holders for line storage when you and your kids are not fishing. For flies, all I can say is that I would very highly recommend fishing with flies tied on barbless hooks. Hooks are very, very sharp, and accidents do happen. If the hook is barbless, the accident is a lot less serious. Most people who are getting their kids into tenkara fishing already have flies. You can certainly use flies that you already have. If they weren't tied on barbless hooks, bend down the barbs as a safety precaution. A kids tenkara kit just seems like a natural. 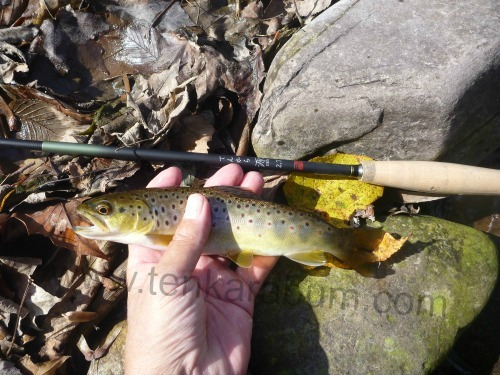 Kirk Deeter of Field & Stream believes tenkara is the best way to teach kids fly fishing. I agree. It may be that the "simplicity" factor of tenkara is overhyped, but when it comes to learning a new skill, simple is better. Casting is pretty intuitive. If you tell kids the goal: "see if you can get the fly over there," they'll modify their casting stroke on their own until they find something that works. It probably won't take very long. Landing a fish is just as intuitive. Experienced fly fishermen frequently ask "how do you bring in the fish with no reel." A kid automatically just raises the rod and the fish comes in. Seen through a child's eyes, tenkara is indeed pretty simple. Line control, certainly one of the more complex aspects of fly fishing, couldn't be easier. If there is too much slack in the line, raise the rod tip. That's line control in tenkara. Seriously! It really is that simple. There are a couple points on which Kirk Deeter and I would probably disagree. First, I'm sure he sees tenkara as a stepping stone on the path to fly fishing. I think for more than a few kids it could be the end in itself. Many kids will go on to fly fishing, but I suspect some of those will come back to tenkara. When they make the switch from tenkara to fly fishing, the number of fish they catch will probably go down. (Not having line in the water causing drag really is a dramatic advantage.) Mature fly fishermen and women may tell you it's all about the joy of being outdoors and that actually catching fish is secondary. For kids, many of whom are outdoors a lot anyway, it really is about catching fish. The second point on which I suspect we disagree is on the choice of rod. Most people would probably choose a regular tenkara rod for kids. That would be a 3.3 or even a 3.6m rod! Many kids, certainly the younger ones, would have to use the rod two handed. I would definitely choose a smaller rod, and I think I have finally found the ideal kid's rod. Please note: all the photos of kids with rods on this page show the rods that used to be in the Kid's Kits. I have very recently found a new rod, but I haven't yet found a new kid to photograph with the new rod. Until people who have kids get the new rods and send in photos, that unfortunate situation will continue. Why not just start with a short rod to begin with? Especially because the shorter rod is a lot lighter and has a smaller grip that will better fit a child's hand? That way you can teach one handed casting and your kid can learn from watching you. I have found a much nicer rod for the Kid's Kit! The new rod is made by Shimotsuke, the same company that makes the Kiyotaki, which many of people like for small streams, and the Ten, which is a premium rod by any standard. I think this new rod, the Tenkara Gen, has a much better action and bend profile better than either the Kiyotaki or the Nissin Fine Mode Kosansui 270. The Tenkara Gen is a fine choice for a kid's rod. It is very inexpensive and it will get your kid started on a wonderful journey. When the Kid's Kit came with the Kiyotaki 24 or the Kosansui 270, I packaged the kit with a piece of size 4 Yamatoyo line equal to the rod's length. I've gotten too busy to cut and package little bits of line, so the kit now comes with a full spool of Nissin Oni line. Although the photo shows size 3.5 line, kit will come with size 4 line instead. 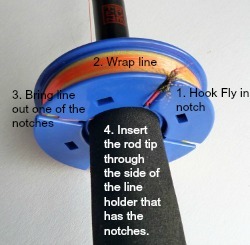 The rod can cast the 3.5, but a kid will have an easier time learning to cast size 4. Rod shown is TenkaraBum 36, not Kid's Tenkara Rod. 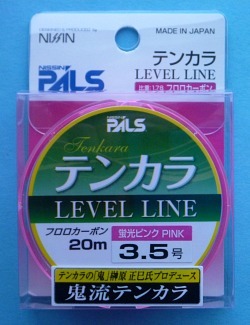 The kit comes with a pair of Tenkara Line Holders. After collapsing the rod insert the tip plug first! That definitely helps prevent the tip from getting broken! Then follow the sequence in the photo to the left. 1) Hook the fly into one of the notches. 2) Wind the line around the holder until there is about a foot of line left. 3) Bring the line out one of the notches. 4) Insert the rod tip through the side of the line holder that has the notches. Carry the rod with the rod tip up. If you have judged the distance exactly, the line holder will snug tight against the cork grip. If the line is a bit short, the line holder will be held in place by the line and by gravity. In addition to the line and line holders, a spool of 5X tippet is included with the kit. The Kid's Kit includes three flies, which will probably be one each of three different patterns but will depend on what flies are in stock. Either the hooks will be barbless or the barbs will have been bent down. Your kid may lose some fish, but I think it is a very important safety precaution. Please note: The Kids Tenkara Rod does not come with a rod sock. The medium rod case fits the rod. The manufacturer has not provided a recommendation. The Kid's Tenkara Rod grip is a two hump "camel" grip, just like that found on most adult's rods. Both ends of the grip have composite rubberized cork, which is much more durable than the cork grip itself. The blank is painted with a matte finish - dark charcoal gray with light olive accents at the section ends. Your kid may not be stealthy, but if the fish get scared, at least it won't be from rod flash. The lillian is glued directly to the rod tip. It is thin enough to pass through the second section. 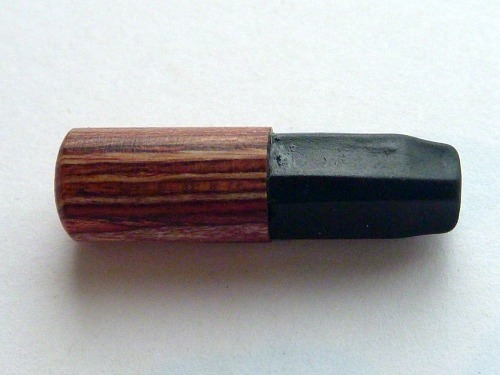 The tip plug is fluted so that the line can be keep on the rod when the rod is collapsed. I would highly recommend inserting the tip plug as soon as the rod is collapsed. Then and only then wrap the line around the line holder. 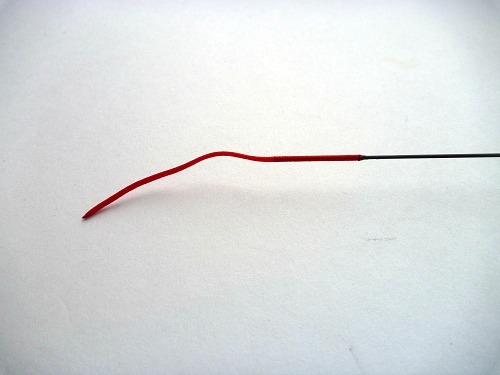 (Doing it that way will produce line twist but it will prevent unsteady hands from breaking the rod tip. The line twist will come out when it is unwound from the holder). 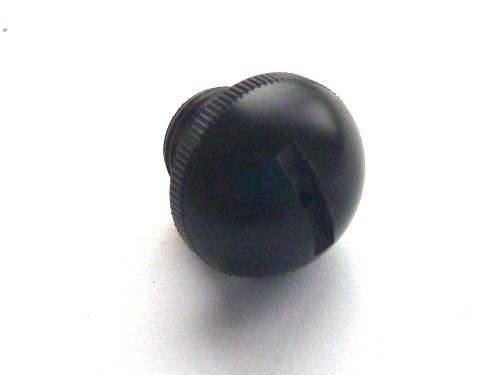 The grip screw cap is knurled, has a slot so you can use a coin to tighten or loosen it, and has an air hole. If fishing with a small child, be sure he or she does not put the tip plug in his or her mouth. It could be a choking hazard. The hooks are VERY sharp. Please provide eye protection and adequate supervision. I would recommend bending down the barbs on the flies. Some fish will wriggle off the hook, but if your child hooks himself (or you) it will make removing the hook much less traumatic. I cannot list here all the dangers associated with fishing. However, studies show that most accidents occur at home, so to be safe you should probably stay away from home. If you're not going to be home, you might as well go fishing and might as well take your kids with you (saves on babysitters). I am sure all sorts of bad things can (and will) happen if you never go fishing. Last week I ordered the kids tenkara kit for my 6 year old's birthday. I knew he was a little young, but thought we would give it a go anyway. We went out for the first time today and I have to say the rod was perfect for him and my other boys who went along. Here is a short youtube clip showing him with a 15-16" cutthroat that he hooked. Thanks for your time and research into what really works. A child does not have to be very old to fish effectively with the Kids Kit. That starter kit and a pair of polarized glasses is the best fishing investment I've made, ever! Being able to easily sight-fish with the glasses, cast precisely, and give a convincing presentation kept my son's interest better than any other fishing we've done. We watched numerous other kids try to catch fish by dragging worms and tiny spinners over them to no avail. 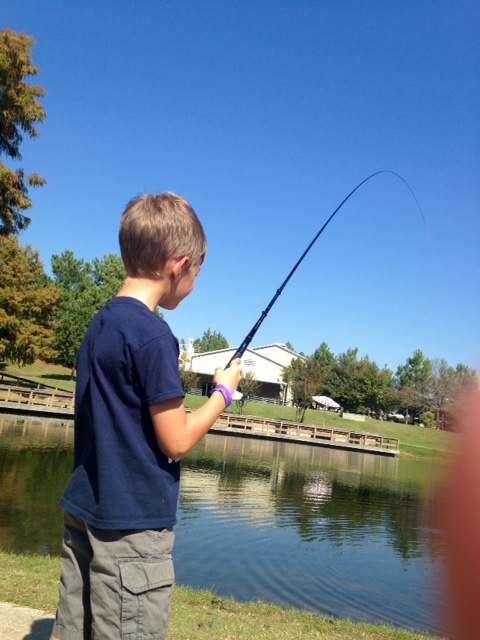 My son would wait for them to get discouraged, then take their place and catch the same fish one after another. We caught 4 species on the new rod on the first night of the trip. I think dad has caught the tenkara bug. It was the most tangle and frustration free day I've ever had fishing with kids, and I liked being able to be on the water in 5 minutes - including instructing my son on how to use the rod. I'm definitely going to get a big kids rod for myself! I recently purchased the kids rod kit from you. I spent 3 hours today fishing a mountain steam in the Cascades in Washington state and had the most fun fishing that I ever had. 47 cutthroat, 43 on one fly before I lost it. The smaller rod made the 8-12 inch fish feel a bit bigger, the rod handled them well. Thanks for supplying me with the awesome product! So, my 10 year old LOVES this rod! So far it's only been Bluegills from the pond but she is HOOKED. Next up will be some brook trout in the Shenandoah National park. I actually fished for trout for the first time exclusively with this rod today and had a blast. Same fly all day, lost count of the fish caught and many were similar to this one attached. I bought a couple Tenkara kids starter kits from you earlier in the summer and we've been having a blast with them on smaller streams in the Wallowa Mountains and Columbia River Gorge here in Oregon. The rods have been a total game changer for family fishing. 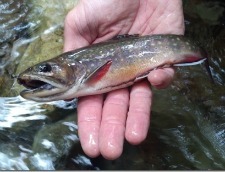 Will send pics of brookies, cutthroat and rainbows in scenic locations soon. Each rod has hauled in at least 200-300 beautiful fish up to 14". My 6 year old had a 36 brookie day on one of the most beautiful stretches of granite strewn high incline alpine streams you've ever seen in Eagle Cap Wilderness a couple weeks ago. Hi Chris! We had a great trip. I don't have a pic of the greenback trout my son caught in Colorado but here is a pic of him and a golden in Cali sierras. The other pics are of us on the last day on the Thompson. 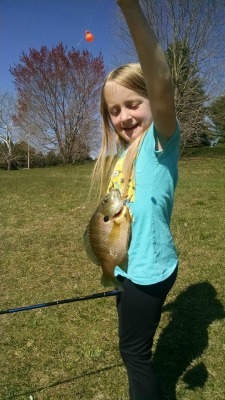 We all love the rod, even my 6 year old daughter got the hang of it and my husband caught a ton of fish off it too...it was his favorite day fishing actually. The whole family is considering getting one! Lol. I've been enjoying the heck out of that kit you sent me. Caught my first tenkara fish (a bass about 4 inches long) while out just practicing! Next weekend our Scout troop will have a campout where there will be small stream fishing and I can't wait to get the kids hooked into some sunfish on that setup! Today was the day!! My daughter actually cast, hooked, and landed her first fish on her own today, 15 of them to be exact!! This was the largest of them! I had to remove the hooks, but she did everything else herself!!! Her trusty Fine Mode Kosansui from Tenkarabum proved itself!! !